We have a small farmer’s market here in town. It’s basically fruit and veg with a bit of meat thrown in here and there. We are getting to the time of year where there is more variety though this growing year has been tough. Too much extremes with heat and rain so the farmer’s have been struggling to grow enough to sell. The thing I like about some of the farmers is that if you have any questions on how to grow your own food they don’t hesitate to tell you their methods. It’s wonderful. And as they mostly follow organic practices it fits right in with our garden. Turns out we’ve been doing garlic all wrong! So this fall we’ll be doing it right. 🙂 Apparently we weren’t nearly patient enough! 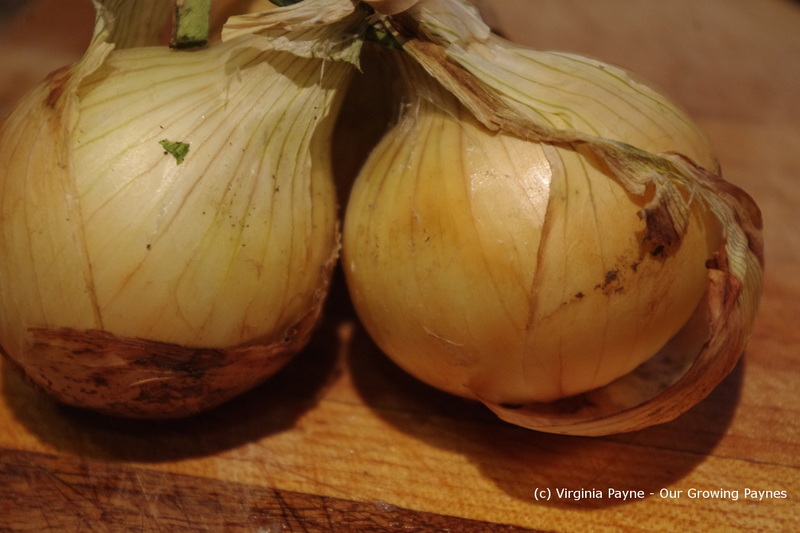 I found some wonderful fresh garlic and sweet onions that I thought would make for a lovely cheeseburger. I’m loving our co-op for local organic meats so we had some ground beef on hand. I know, I should really grind the meat myself. I’ll get to that at some point! To start I minced a few cloves of the garlic and mixed it in with the meat with salt and pepper and some Worcestershire sauce. Then I grated some Irish cheddar. I didn’t really measure anything, just eyeballed it. 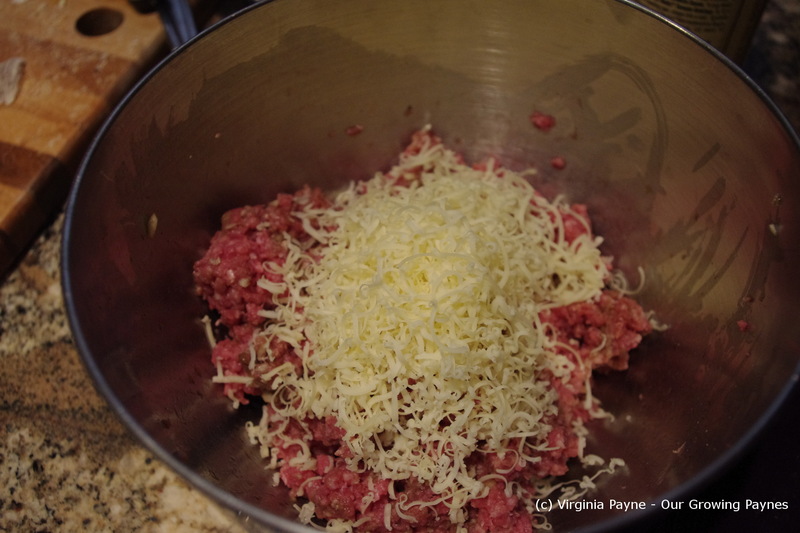 I then mixed in the cheese. Of course, given the nature of the cheese it clumped up so I had to “shred” it a bit with my hands. It’s important to mix well but not to overwork the meat. I formed them into patties and set aside while I prepped the onions. 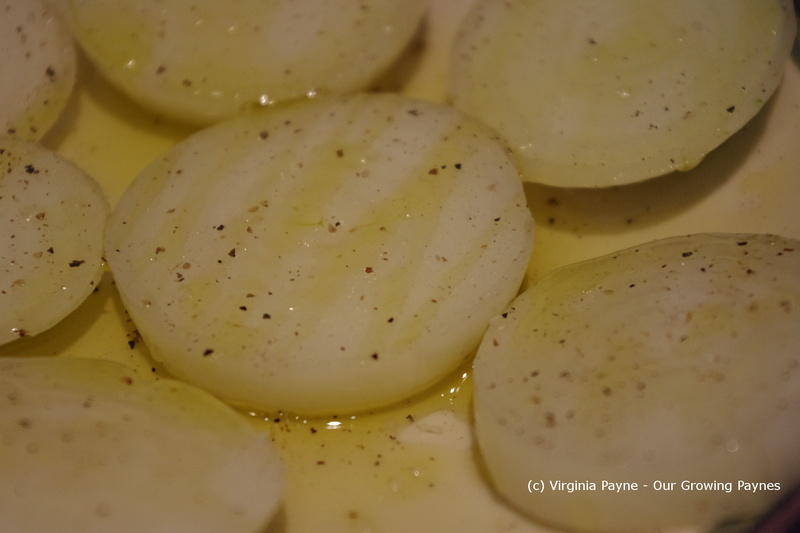 These were small onions but I sliced them about 1/4″ thick, seasoned them with salt and pepper, and drizzled with olive oil. Then I kept my fingers crossed as the last time I attempted to use the grill it would barely get warm. Have no idea why though we speculated it may have been to humid. Whatever the reason, it worked. Yay! 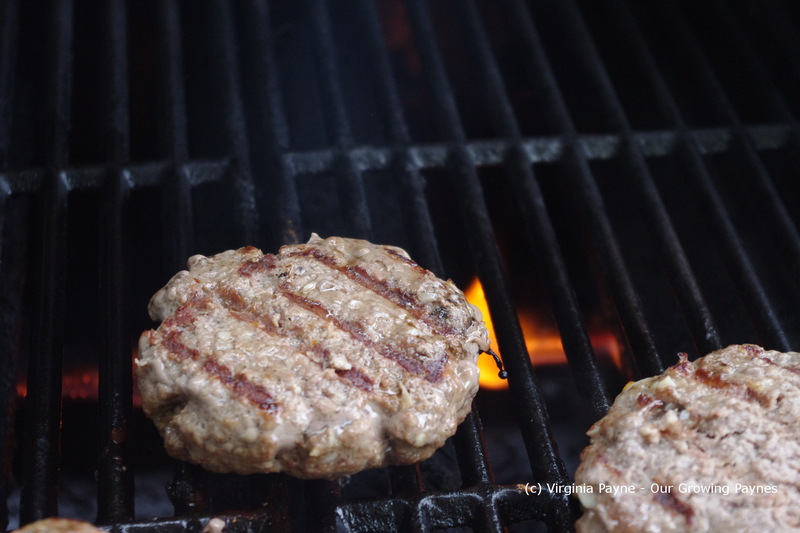 The way I do our burgers is I put them on the grill for a few minutes to brown then flip again and cook for several minutes. I do one last flip and melt the cheese on it to finish off. Never press the burgers as you don’t want the juices disappearing. 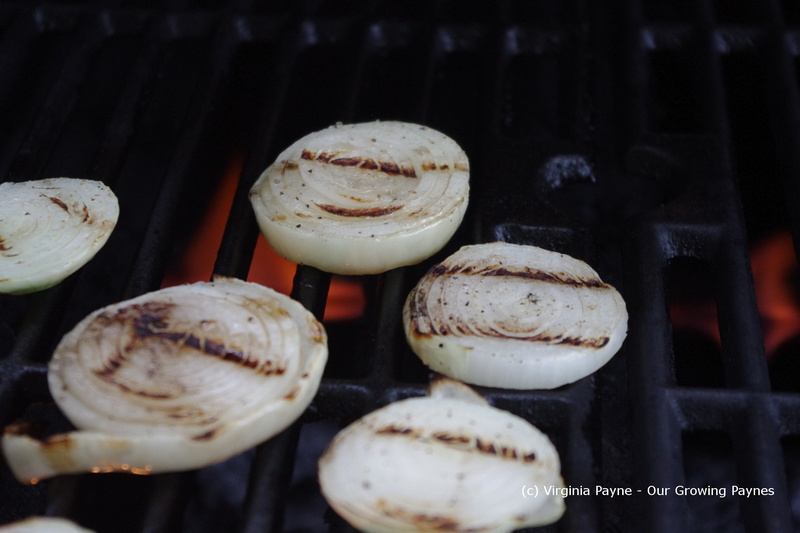 Halfway through cooking the burgers I start grilling the onions. Just until they have a bit of charring and they have softened. I was talking with my doctor this week saying how it is harder to lose weight now that I’ve joined the 40’s. I don’t have a lot to lose but it’s annoying that I’m eating less and exercising more and the scale just likes to stick to a certain number. Granted I’m gaining muscle but it should be shifting! She mentioned that there has been research into the method of eating your carbs in the morning and scaling back by evening. Because you need some carbs for fuel. Though potatoes are wonderful if you keep the skin on. Actually helps fight fat. Anyway, I opted to have my burger sans bun. We served them with a lovely salad and it was just the right amount to eat. Though I didn’t have room for our gooseberry apple crumble. Which is a shame. Overall it was a juicy yummy burger and a very good balance with the salad! This entry was posted in Beef Recipes and tagged beef, cheddar, cheese, cheeseburger, cooking, dinner, food, grilled onions, Onions, organic meats, salad, sweet onions. Bookmark the permalink. 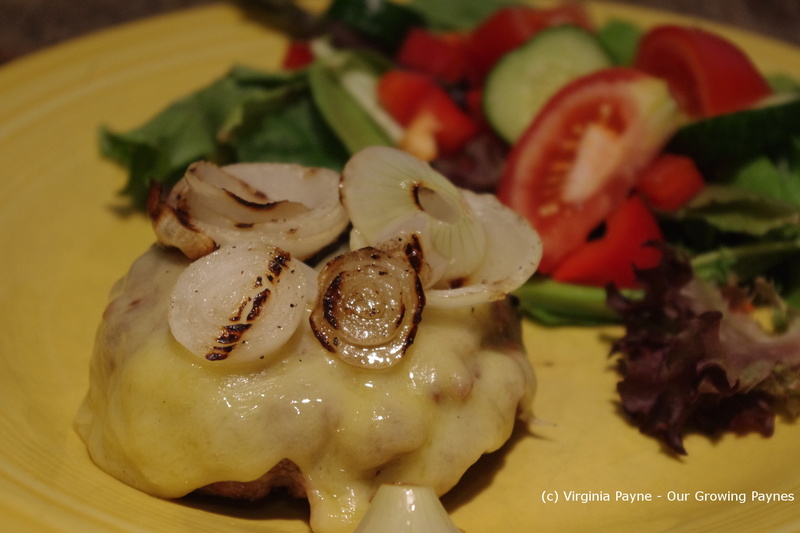 Delicious burger….works with or without the bun for me. Thanks. I like that it is very easy to throw together as well. My favorite way to eat a burger – cheese and onions. Looks yummy. I’ve always thought burgers taste so much better without bread. Unless you’re having to eat with your hands standing up! I love everything about this post! I love burgers. Very inviting post! Garlic is good! Love that first shot. Thanks. 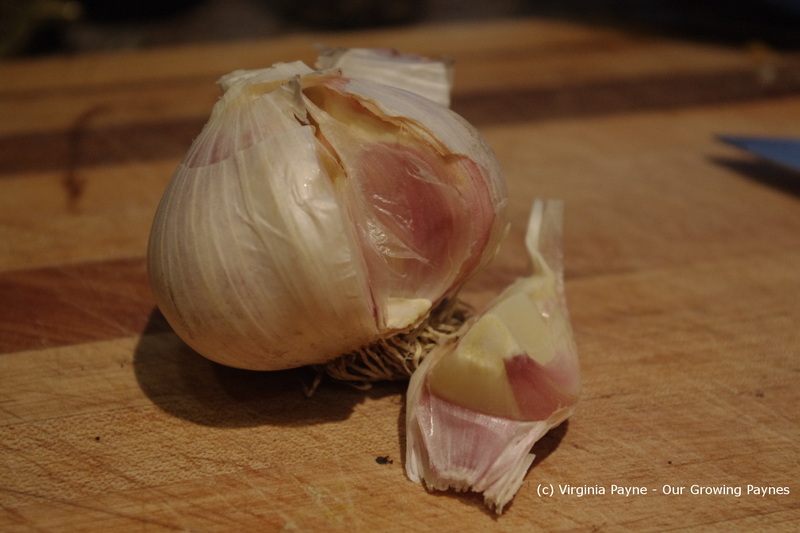 🙂 I love garlic, one of my favourites!